The Car GuideTests and FeaturesTest DrivesNissan Versa: All positives…almost! 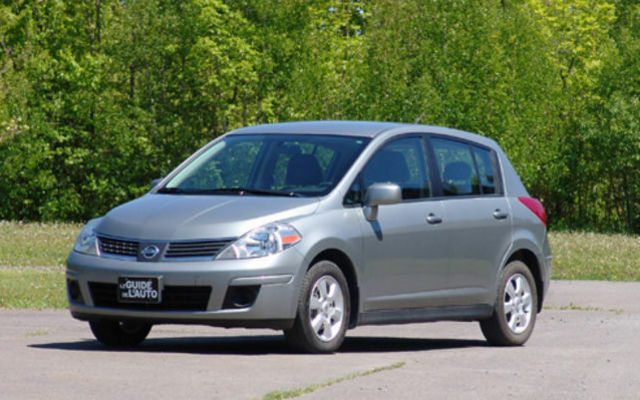 The Nissan Versa seems to be multiplying at an exponential rate on Quebec’s roads since its launch in 2007, so we felt that a long-term test drive was in order. A few months before receiving our Nissan Versa Hatchback SL 2008, we did an extended test drive of a Sentra S, so we were in familiar territory. However, it was not long before we discovered that the Versa is much more than a Sentra hatchback! Beneath the Versa’s massive contours lies a subcompact with no reason to be jealous of the competition. When we began this long-term trial, the Versa was offered in both sedan and hatchback versions. The car owes its success mainly to the hatchback, with the sedan and its simpler, less fluid lines going relatively unnoticed. This modification to the catalogue aside, the Versa has not changed in 2009. The Versa’s passenger compartment is spacious, which is to be expected considering the size of the vehicle. It has room for five adults to sit comfortably with enough storage space to meet all of their needs. It is easy to get in and out of the vehicle and all of the controls are easily accessible from the driver’s seat. At 6 feet tall, I had a hard time trying to find a driving position where my knee was not pressed up against the centre console. The dashboard was easy to read even though a few times I confused the blue engine temperature warning light (unfortunately there is no gauge for this important detail) with the high-beam indicator light once night fell. On a different note, the hatchback opens wide to transport large items without any problems. However, it is a shame that the ledge is slightly higher than the floor of the trunk, which sometimes makes it more difficult to remove a heavier box. It is also too bad that the seats, once folded down, do not lay flat. As for visibility, there were no real problems although the blind spot on the left side seemed very significant. The small triangular windows that are creating a buzz improve visibility but also let a little more light into the passenger compartment. Our test model had a 1.8-litre engine paired with an Xtronic continuously variable transmission (CVT). With its 122 horses, this engine, the only one offered for the Versa, features power that is close to what the other compacts are offering. Having driven a Nissan Sentra equipped with the same transmission a few months before, I must say that I preferred the handling of the Versa and its faster responses to the accelerator hands down. In acceleration, the engine is noisy mainly because of the continuously variable transmission that keeps the engine speed at a very high level as long as you do not release the accelerator. The inferior soundproofing also adds to the sound level. On the other hand, at a constant speed the engine was quiet. As mentioned earlier, the Versa has a massive shape. Tipping the scales at about 1,260 kg, the Versa is roughly 150 kilos heavier than its main rivals, and this extra weight is most noticeable on the road, mainly in turns and when braking. The brakes on the test model always ended up squeaking slightly. Except for the few scratches sustained after an incident with a Honda Civic, we returned the Versa unscathed. No mechanical problems surfaced over the few months of our trial, and while the vehicle had to be taken to the garage, it was only to put on summer tires and for an oil change. The model that we tested consumed approximately 8.2 litres of fuel per 100 km, which is slightly more than Nissan is suggesting. On the other hand, we drove the vehicle mainly in Sherbrooke, Québec, where the number of hills undoubtedly influenced fuel consumption. With performances similar to those of a compact, better equipment and a competitive price, the Versa holds its own quite well against the competition, especially when the number of Versas on our roads is taken into account.